entertainment console for media at your fingertips. Users can watch TV, browse the internet or stream audio while working on their fitness with this 10.1” touchscreen display. This elliptical features a smooth pedal motion to minimize joint stress. The robust drive train system is not only durable, but designed to stand the test of time. Combine that with the 2-degree inversion of the pedals for an ergonomic foot path.Spirit Fitness XE195 Elliptical Trainer. The XE195 is our entry level elliptical. It is just as dependable as our other models, but with a few less programs and features. This model is very appealing to someone that wants a reliable unit without the adjustability and added features. This unit features a 7.5” bright blue backlit LCD console, an extensive amount of exercise data, electromagnetic resistance, a post workout summary of the accumulated data, and a 2” Q-Factor (space between feet). Spirit Fitness XE195 Elliptical Trainer. The XE195 is our entry level elliptical. It is just as dependable as our other models, but with a few less programs and features. This model is very appealing to someone that wants a reliable unit without the adjustability and added features. This unit features a 7.5” bright blue backlit LCD console, an extensive amount of exercise data, electromagnetic resistance, a post workout summary of the accumulated data, and a 2” Q-Factor (space between feet). Spirit Fitness XE295 Elliptical Trainer. The XE295 is our mid-priced traditional elliptical. It has the same features as the XE195 plus two heart rate and user programs, additional console feedback, adjustable pedal angle, and various hand grip positions. This model is very appealing to someone that values extensive feedback and variety. Spirit Fitness XE395 Elliptical Trainer. The XE395 was designed with 20 levels of electronic incline and 3 foot pedal angle settings to keep your workout challenging and effective. Proper ergonomics and biomechanics, a solid feel, important workout data feedback, and effective programs will help you stick with your exercise routine and achieve your long term fitness goals.The XE395 is our top of the line traditional elliptical. It has the same features as the XE295 plus a power incline ramp and handlebar remote incline and resistance buttons. The Spirit Fitness XE795 was designed with Comfort, Spirit Fitness XE795 Elliptical Trainer. The Spirit Fitness XE795 features a natural 20" stride length and narrow pedal spacing to ensure an ideal stride motion, while the oversized/cushioned foot pedals and cushioned ergonomic hand grips ensure comfort at the touch points. The XE795 is self-powered, meaning no cords to worry about. You can place this product anywhere. The large sealed roller bearings used with the pedal arms and handlebars, along with the dual roller wheels and aluminum tracks, ensure a smooth and reliable workout. The frame has been constructed as one solid welded piece from front to back for added stability and durability, while minimizing noise. The CE800 is designed with convenience, comfort, reliability, and aesthetic appeal in mind. We are confident that if people enjoy the experience – proper ergonomics and biomechanics, a smooth, quiet stride, important workout data feedback, and challenging programs, that they will adhere to a regular exercise routine. This unit features a multitude of program options, wireless and contact heart rate, a 20” stride length, 40 levels of resistance, a 30 lb. flywheel, and an extensive amount of console feedback This model is very appealing to someone that values a smooth ride and extensive data feedback. 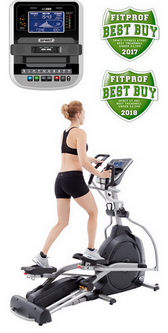 CE800 ENT Designed on the solid CE800 platform, the CE800ENT elliptical trainer incorporates touchscreen technology on a large 10.1” ENTERTAINMENT display. TV, web browsing, and music streaming are all made possible within a user interface that is easy to use and adaptable to nearly any facility. The CE800ENT was specifically engineered for the commercial environment, from its heavy-duty steel frame to its durable powder coat paint finish. Its design focuses on convenience, comfort, reliability, and aesthetic appeal. Spirit Fitness XE895 Elliptical Trainer. The Spirit Fitness XE895 has the flexibility to allow users to simulate the full body motion of a walk, jog, or run. The electronically adjustable stride length (18"-24" in .5" increments) and narrow pedal spacing ensure an ideal stride motion, while the oversized/cushioned foot pedals and multi-position hand grips deliver maximum comfort for users of all sizes and fitness levels. The XE895 features premium components including large sealed roller bearings used with the pedal arms and handlebars, dual roller wheels, and aluminum tracks to ensure a smooth and reliable workout. The CE850 is designed with convenience, comfort, reliability, and aesthetic appeal in mind. We are confident that if people enjoy the experience – proper ergonomics and biomechanics, a smooth, quiet stride, important workout data feedback, and challenging programs, that they will adhere to a regular exercise routine. This unit features a multitude of program options, wireless and contact heart rate, a 24” stride length, 20 levels of resistance, a 30 lb. flywheel, and an extensive amount of console feedback This model is very appealing to someone that values a smooth ride and extensive data feedback. Why choose to invest in an elliptical, instead of a treadmill or a semi-recumbent bike? The elliptical can be considered a middle ground product when comparing it to other forms of cardiovascular exercise. A reason to choose this over a treadmill would be the lack of impact on the joints. Another advantage is that along with strengthening your heart, you can also focus on strengthening all lower body muscles by increasing the resistance necessary to complete the ellipse pattern. The advantage over a semi-recumbent bike is that this form of exercise is full weight bearing. This means that along with strengthening your muscles, you will maintain or increase the bone density in your lower body. The first step is to decide what features you desire. The XE series ranges from a basic unit with limited programming to units with sophisticated programming, adjustability, and incline features. Arizona Extreme Fitness will deliver and setup your favorite quality Spirit Fitness Elliptical Trainer for home or commercial use in Prescott, Flagstaff, Sedona and Phoenix, Arizona at your location. Come on in and browse our 3000 sq ft warehouse showroom in Prescott Valley, Arizona and try before you buy or if you already know what you want just call us for our best price and we will deliver or ship it to you depending on your location in the USA. We sell, deliver, setup, install and service the above Spirit Fitness Elliptical Trainers and more.